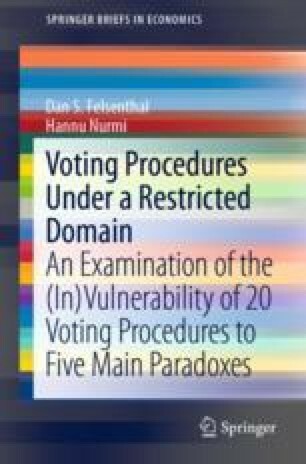 This chapter focuses on the possibility that some well-known voting procedures lead to specific types of monotonicity paradoxes in preference profiles that are characterized by the presence and election of a Condorcet winner. Moulin’s (Journal of Economic Theory 45:53–64, 1988) theorem establishes the incompatibility of Condorcet-consistency and invulnerability to the No-Show paradox in voting procedures when there are more than three alternatives to be chosen from. We ask whether this conclusion would also hold in the proper subset of profiles distinguished by the property that a Condorcet winner exists and is elected in the initial profile. Our focus is on 20 voting procedures designed to elect a single candidate. These procedures include both Condorcet-consistent and non-consistent rules. The former are, however, only briefly touched upon because their invulnerability to most types of monotonicity violations in the restricted domain is obvious. Construct a preference profile with no Condorcet winner showing that the Alternative Vote procedure is non-monotonic in a fixed electorate. Show that Nanson’s procedure and Borda Elimination (BER aka Baldwin’s) procedure may lead to different choices when a Condorcet winner does not exist in the initial profile. Nanson proved that his procedure necessarily elects the Condorcet winner if one exists. Does the same apply to BER? If it does, explain the reason; if not, provide an example where BER does not end up with the Condorcet winner when one exists. Show that Coombs’s procedure is vulnerable to the strong No-Show paradox when the social preference ordering in the initial profile contains a majority cycle. A procedure is calledMaskin monotonicif whenever a candidate, say x, wins in an initial profile, it also wins when its support is increased or kept the same with respect to every other candidate. (N.B. there is no ceteris paribus clause in this definition). Show that the Plurality Voting procedure is not Maskin monotonic (Maskin, 1999). Show that the Borda count is not Maskin monotonic. Now b is eliminated, whereupon c wins. Here a wins by Nanson’s method since both b and c have a lower than average Borda score. On the other hand, BER eliminates first b, whereupon c defeats a and becomes the winner. BER eliminates at each counting round the candidate with the lowest Borda score. This cannot be the Condorcet winner since the Condorcet winner has always a strictly larger than average Borda score. Thus, the Condorcet winner survives all counting rounds and wins according to the BER procedure. Here the social preference ordering contains a majority cycle: a defeats b, b defeats c and c defeats a. Candidate b wins once a has been eliminated. If the three last mentioned voters abstain, b is eliminated first and then c wins. This is obviously preferred to b by the abstainers as c is their top-ranked candidate. Here a wins. Now lifting b ahead of c and d in the last two voters’ preferences does not change a’s position vis-à-vis the others. Yet, after the change b becomes the Plurality winner. Here a wins. Improve now a’s position in one voter’s ranking and move c ahead of b in the first and second groups’ preferences. This does not deteriorate a’s position. Yet, after the change c wins because these changes result in the following profile (where c wins according to Borda’s count procedure). a > c > b.